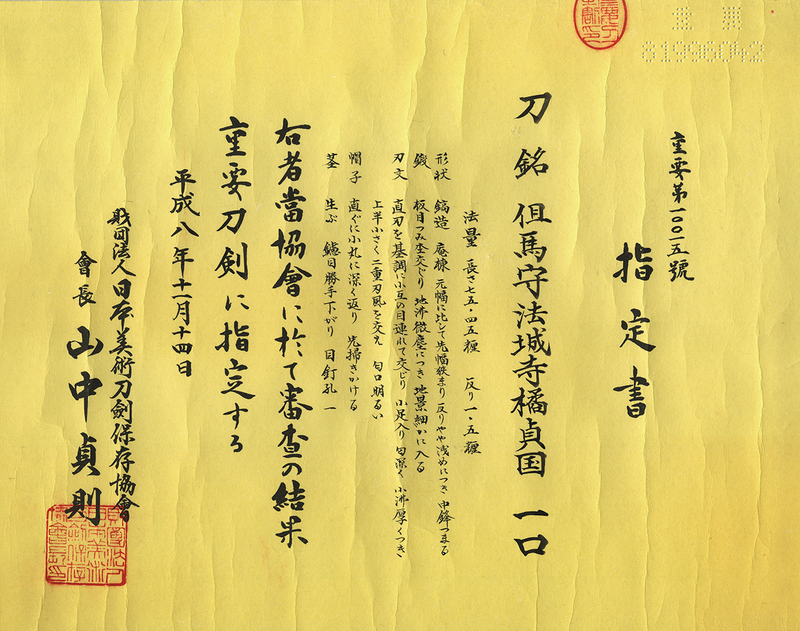 Signature : Tajima Kami Hojoji Tachibana Sadakuni. The blade was polished by the top ranking sword polisher. The Jigane is bright blackish slightly blu nice fantastic color jigane. Blade length : 75.42 cm or 29.69 inches. Weight of only blade : 790 gram. 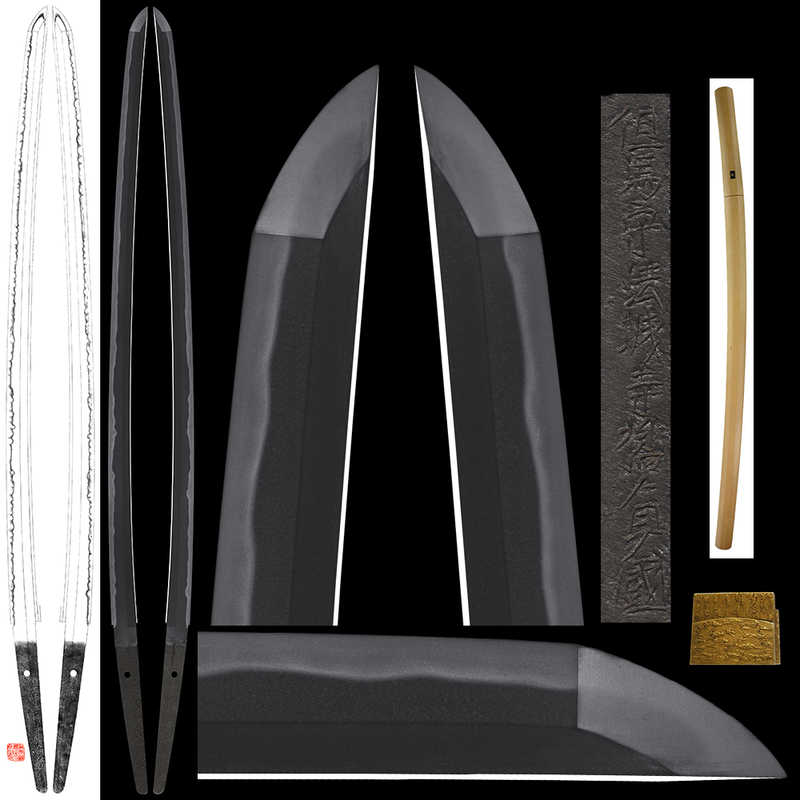 Shape : The blade is wide and thick with small sori and longer kissaki. Jitetsu : Ko-Itame hada well grained with jinie attach beautiful texture. Hamon : Niedeki gunome midair like Jyuzu ba hamon with ashi. In Ha, there are sunagashi and kinsuji scatter. Kissaki is Notare and round shape. Special feature : Tajima Kami Hojyoji Tachibana Sadakuni was working at Edo as Edo Hojyoji school. 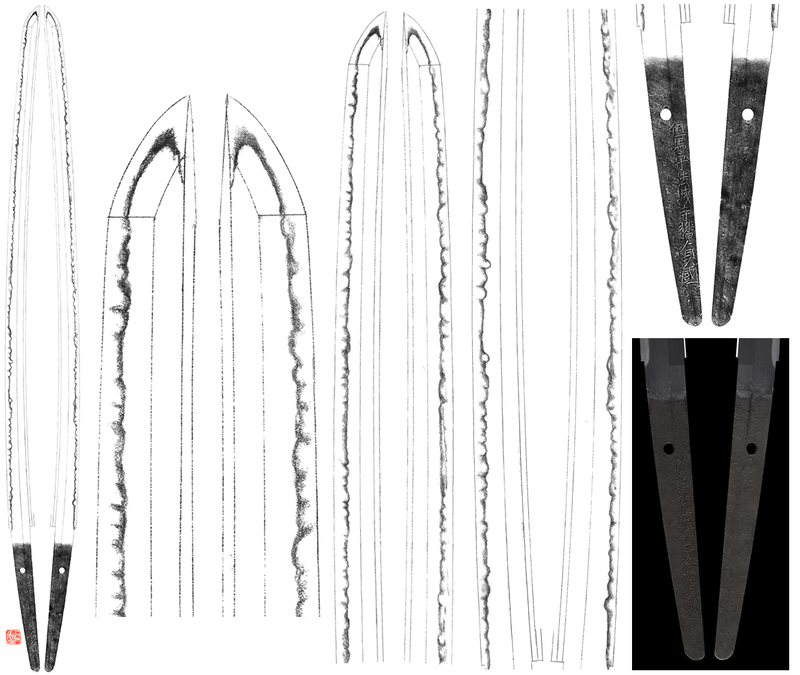 From the shape of the sword, the blade is older than Kanbun era probably Kanei era. and Kotetsu. Hojyoji Tachibana Sadakuni is very similar hamon like Kotetsu Jyuzuba hamon. According to the old sword judges, Kotetu is very similar with Sadakuni. I think probably he was aquatinted with each other. This sword is very attractive Jyuzuba hamon with sunagashi and kinsuji which remind us Kotetsu. The blade is polished by one of the best polisher which is blackish slightly blue color nice Jigane. The sword was selected as #42 Jyuyo Token. According to the explanation of the Jyuyo zufu. 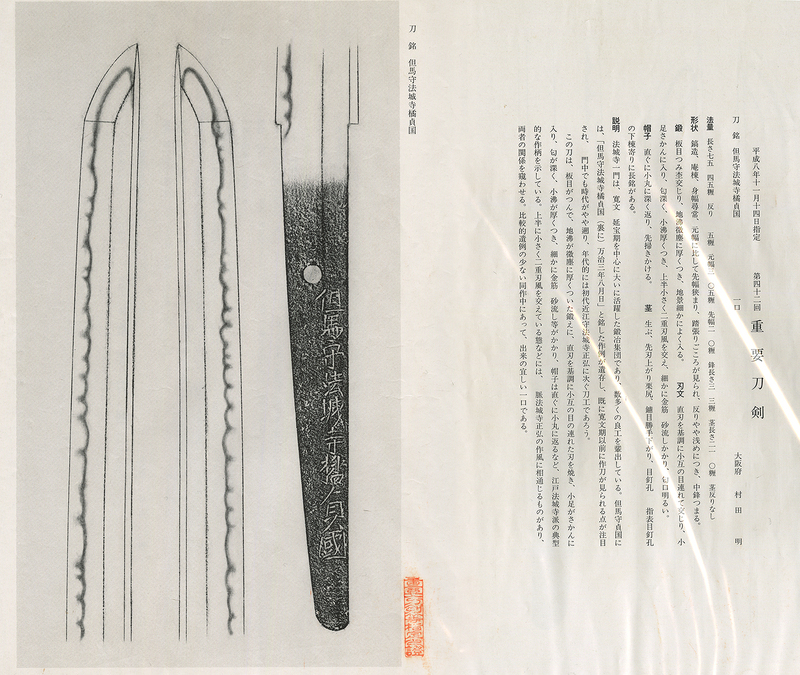 Hojyoji school was working at Kanbun to Enpo era and produced a lot of famous sword makers. so it is remarkable point which means he made sword earlier date of Kanbun era. He was working at the same time like Hojoji Masahiro. Tsuba : On the mokko style iron Tsuba, dragon and clouds are painting with gold color. Fuchikashira : On the iron plate, dragon and clouds are painting by gold color. Saya : Dark brown cloer Ishimeji style. Menuki : A shish dog is engraved by syakudo plate with gold color.